Lock in a great price for Virrey De Mendoza – rated 8.3 by recent guests! The breakfast was good, in spite of the horrible coffee. The building is beautiful. Beautiful historic building in the historic center of the town. Staff was responsive to my requests and helpful. 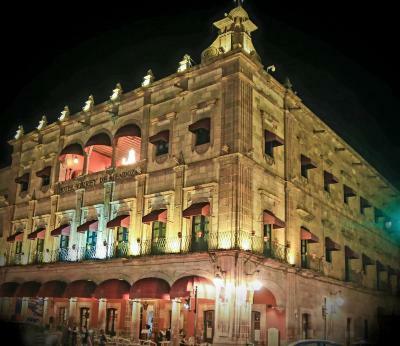 The only thing to like is really the location in the historic centre of Morelia. The lobby is nice and the terrace has some fine views. Other than that, it's just not worth it. The hotel itself its a real jewel of colonial arquitecture. Great location, very friendly staff, elegant rooms, good food. Would definitely stay here again. Location, amazing historic build from XVIII century. Virrey De Mendoza This rating is a reflection of how the property compares to the industry standard when it comes to price, facilities and services available. It's based on a self-evaluation by the property. Use this rating to help choose your stay! Located 350 feet from Morelia Cathedral, this historic hotel offers elegant, colonial-style rooms with free Wifi, and cable TV. All guests receive a free welcome cocktail on arrival. Virrey de Mendoza is located a 2-minute walk from Plaza de Armas Square, in Morelia’s historic center. The Colonial Art Museum is around 1,150 feet away. The hotel offers free parking. Characteristic Michoacan dishes and international haute cuisine are served in the hotel’s restaurant. There is a cocktail bar with a pavement terrace. You can also enjoy live piano music in the stylish lounge-bar. Rooms at the Virrey de Mendoza are individually decorated and include antique furniture. Each room has a private bathroom with a hairdryer. Rooms have views of the central atrium or Madero Avenue. When would you like to stay at Virrey De Mendoza? This room features a balcony, a patio and a private bathroom that includes a bath and a hairdryer. It also has a flat-screen cable TV and linens. Some of these rooms also have views overlooking Avenida Madero. This spacious room includes a seating area with a flat-screen TV and some of them have a balcony overlooking Madero Avenue. These spacious suites include a seating area and some have a balcony with views of the city center. This double room features a cable TV, and private entrance. This double room has a private entrance, and soundproofing. Some rooms overlook Avenida Madero. House Rules Virrey De Mendoza takes special requests – add in the next step! Virrey De Mendoza accepts these cards and reserves the right to temporarily hold an amount prior to arrival. Restaurant was open only for breakfast, with only one option in the menu. There was no room service, no bar service. Part of the employees were on strike. The staff seemed very unhappy, and we could feel it. It was confirmed by a strike outside the building. The management should deal with this situation. Lack of room service was also surprising. Squeaky floorboards. Noise from the street. Have stayed here before and it seems the rooms are showing their wear. It was sad for me to see because I had such grand memories. Love the location and the ambience. The food was good. Staff where not friendly at all. When I ask for something they make bad faces. More parking. But no complain. Beautiful lobby. Excellent staff. Friendly and helpful staff. Spotty wifi, no air-con, no safe-box. Ubicación, Arquitectura, Amplitud de espacios.